I recently popped the photo above up on my instastories on instagram and a number of you asked for the recipe for the smoked mackerel pate. It is wonderfully versatile and can be used as a ‘dip’ with drinks or as a ‘starter; either way it’s a good option all year through. My mother used to make it a lot when I was a child, a recipe she originally found in ‘The Cooking Canon’ cookbook. Anyone else remember those retro little pocket recipe books? Anyway this is my version of smoked mackerel pate, it’s super easy and you can get as creative with it as you like. Perhaps alternate with different fresh herbs or sprinkle cayenne pepper on the top instead of chives, but personally I love it with fresh dill and a scattering of chives. In a blender add all the ingredients (except the chives), breaking up the mackerel as you place it in the blender. Blitz it briefly so you get a creamy pate. Add more creme fraiche/horseradish if it needs to be loosened up a little. Add more lemon if needed. 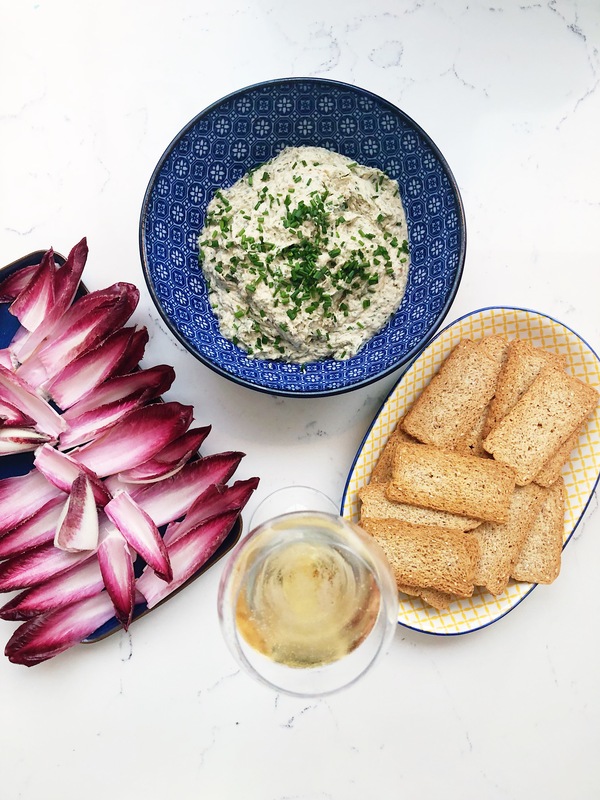 Serve with chives scattered on top with the option of melba toast – I love these – and purple endive.